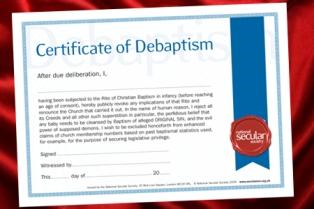 Over 100,000 Britons have downloaded a ‘Certificate of Debaptism’ from the National Secular Society (NSS) in the UK to publicly demonstrate their separation from Christianity. 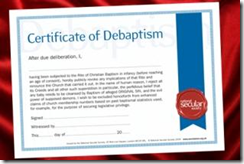 The majority were baptized into the Church of England as infants and now as adults have decided to reject the church. According to the article, similar movements are spreading to other countries, including a well organized move against Catholicism in Argentina. Response: This is a rather sad development. A generation ago most Britons were baptized into the state church as infants. Now as the secular and the atheist movements gain numbers and cultural credibility many adults are seeking to ‘divorce’ themselves from their former ‘Christian’ identity. Actually this is really not all bad. It is far better to be either hot or cold. After all, the declining British ‘cultural Christian’ identity has lately produced a weak church. It is actually harder in many ways to bring ‘Cultural Christians’ to Jesus than any other religion. Their ‘luke-warm’ version of Christianity actually inoculates them from seeking the real McCoy. This entry was posted in -The Church, Culture Wars, News Commentary, Secularism and tagged -Atheism, Secularism. Bookmark the permalink.